At the present time, my favorite night to prepare dinner is Friday. In fact, I’ve created a homemade pizza sauce to celebrate Friday. While the week comes to an end my family and I are able to gather on this day. What better way to connect with one another than to get in the kitchen and make a pizza. 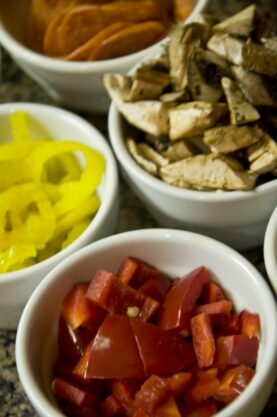 Nothing beats chopping up fresh vegetables from the home garden to celebrate Friday with homemade pizza sauce. This is a recipe I copied from an old index card from my Dad’s recipe file. In fact, it has a little sauce smugged on the cards so I know it was good! Pizza night is one I remember as a child and a tradition I continued when I had my own family. I hope you will be able to give this recipe a try. 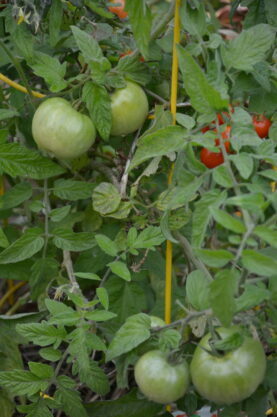 Dice clean tomatoes and discard seeds if wish. Cook tomatoes on high in sauce pan. Add salt, olive oil, tomato paste, garlic, basil and bay leaf. Bring to a boil, then lower heat to a simmer. Cook over low heat stirring occasional so it doesn't burn to bottom of sauce pan. In a bout 10-15 minutes the sauce will be ready to use. This can be stored in refrigerator for up to 5 days. I do not recommend freezing this sauce because the skin is left on during dicing. Peppers from the Autumn garden are all red by this time of year and the tomatoes are what we canned up last summer. Slice everything up and make it fun to create a meal. Peppers from the Autumn garden are packed with flavor. Clean and slice all the homegrown freshness up and make it fun to create a meal. 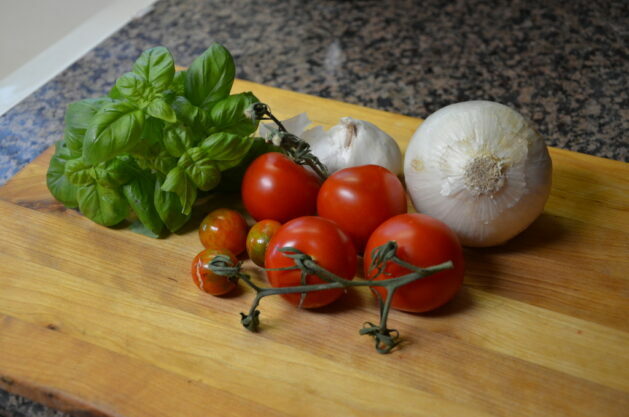 Consequently, your kitchen will smell like Italy due to the fresh herbs picked and prepared. My homemade pizza sauce is thick and full of bold flavor. I hope you can use this recipe Maira!